Key Difference: Shoes refer to the many different types of footwear that is available for both men and women. Boots are a distinctive type of shoes that cover the wearer’s sole, ankle and sometimes even calves, knees and hips. Every girl can vouch for the fact that shoes can either make or break an outfit! Although for many people shoes these days mainly serve as a purpose of making a fashion statement, shoes have been around and serving a different purpose for centuries. Shoes were originally created for comfort and protection of the feet and now people forego that same comfort to make themselves look trendy and hip. There are many different types of footwear that exists, so what exactly is the difference between shoes and boots? The oldest pair of shoes found are sandals that can be dated back to approximately 7,000 to 8,000 BCE, found in Oregon, US. It can be inferred that these shoes served the purpose of protecting the feet from multiple things, such as heat cold, rocks, and other such items that can result in hurting the feet. More shoes of different types have been uncovered since including shoes made of leather, cow hide, bear hide, deer skin and other such items. Experts believe that shoes probably existed long before the oldest uncovered specimens found as the reduction of the size of the pinky toe on the feet can be attributed to covering of the foot. The decreased thickness of the last toe can be dated back approximately 40,000 to 26,000 years ago. So what exactly are shoes? Shoe is an umbrella term that encompasses a variety of different types of footwear. Shoes serve the purpose of protecting the feet, ankle and sometimes even calves against external conditions. They can also be used for comfort while performing various activities and are now considered as an item of decoration. The design and purpose of shoes vary depending on culture and its intended use. Traditional Japanese footwear were wooden sandals that had slight heels and were held together with rope. While, traditional Dutch shoes were made from a piece of wood, covered the foot till the ankle and had a wooden heel. These shoes were worn for heavy labor and are also considered as the inspiration behind tap dance, because of the tap noise made by the heel. The terms clog now refer to any shoes that has a wooden sole or heel. These are just two of many different types of shoes that exist. There are many different types of shoes depending on the need of the wearer. Few of the popular different types include: Athletic shoes (sneakers, canvas or tennis shoes, football stud shoes, etc. ), Boots, Dress, Heels, Pumps, Casual, Loafers, Dance and even orthopedic ones. Shoes also come in various sizes depending on the size of the wearer’s feet. There are also some shoes that serve certain purposes such as gum boots, which can be used for wading through water or slime. On the other hand, boots are a type of shoes that mainly covers the foot and ankle but some boots can extend up to the leg to cover the calves, knees and sometimes can even the hip. 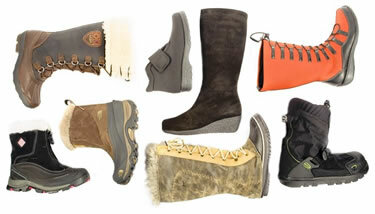 Most of these boots come with a heel, but some can even be flat such as Uggs or similar snow boots. Originally boots were made of leather or rubber to protect the wearer from weather and certain conditions, but these days, boots are made from a variety of materials. Boots are worn both for their functionality – protecting the foot and leg from water, extreme cold, mud or hazards (e.g., chemicals) or providing additional ankle support for strenuous activities (e.g., hiking) – and for reasons of style and fashion. There are also specialty boots that are made for a specific purpose, such as protect steelworkers' feet and calves, protection from hazardous chemicals or to protect from extreme cold, etc. Some boots that were originally made for a purpose have now become a fad, such as cowboy boots or riding boots, army boots are now used for pairing with ripped jeans for a ‘grunge’ or ‘punk’ look. Fashion boots for women come with many variations including straps, tapered or spiked heels, platform, wedges, zippers, pointed toes, etc. In short, shoes refer to the many different types of footwear that is available for both men and women. Boots are a distinctive type of shoes that cover the wearer’s sole, ankle and sometimes even calves, knees and hips. Formal shoes, Casual Shoes, Sneakers, Orthopedic shoes, Athletic (includes running, sports and even bowling), converses, boots, Dress shoes, Ballet, pumps, flats, wedges, etc.